Head of the Jewish community in Prague for two decades beginning May 20, 1724, and a stanch defender of his oppressed coreligionists; died June 9, 1745. He was wealthy by inheritance, and his extensive business interests brought him often into contact with the great of the land; he thus gained a knowledge of the laws of the country which raised him high above the mass of his brethren. He founded an orphan asylum, and won lasting popularity by elevating the standard of the Jewish school system. He was, however, very fond of display, and not free from ambition. At the birth of Archduke—afterward Emperor—Joseph in April, 1741, he furnished at his own expense a costly public festival and parade in the Jewry of Prague, on which occasion he appeared in a carriage drawn by six horses and surrounded by footmen and horse-guards. This fondness for show aroused the envy of the mob, which some years later found vent in unrestrained pillage of the Jewry, several Jews being murdered and many more severely wounded. Following upon this came Maria Theresia's order expelling all Jews from Bohemia. 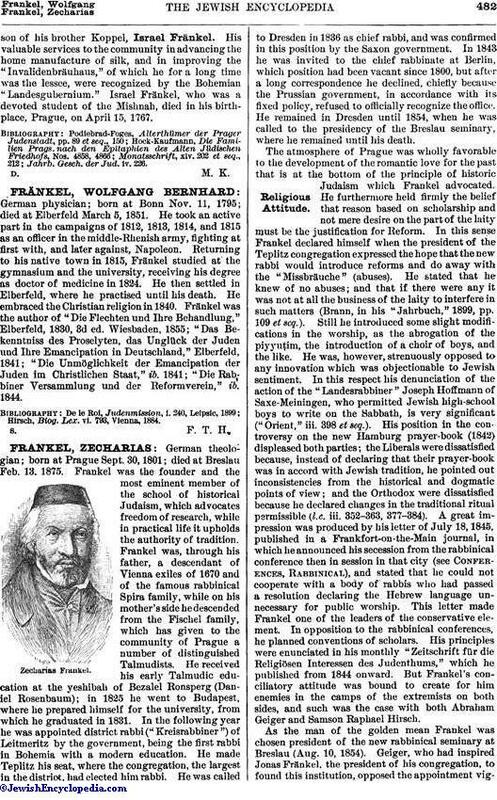 Simon Wolf Fränkel, who was insulted and slandered, collapsed completely under the burden of mental and spiritual troubles. Only a few days before his death he signed a petition for aid addressed to the London Jews. His successor as the head of the community was ason of his brother Koppel, Israel Fränkel. His valuable services to the community in advancing the home manufacture of silk, and in improving the "Invalidenbräuhaus," of which he for a long time was the lessee, were recognized by the Bohemian "Landesgubernium." 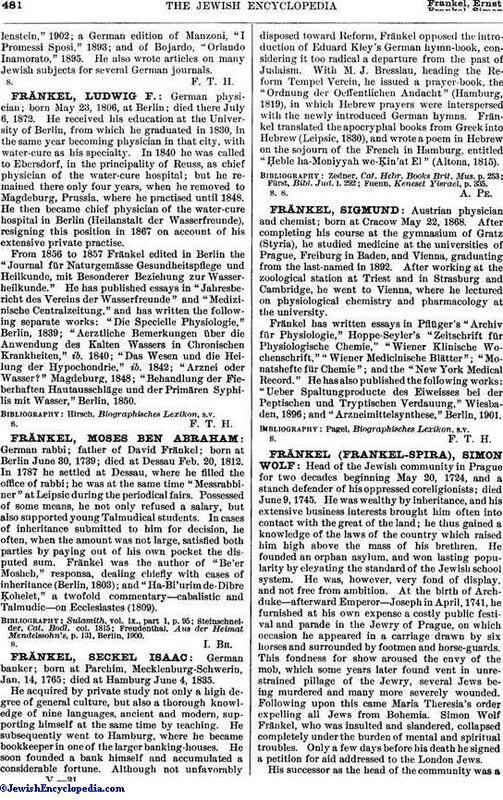 Israel Fränkel, who was a devoted student of the Mishnah, died in his birth-place, Prague, on April 15, 1767. Jahrb. Gesch. der Jud. iv. 226.